The Havit M22 Outdoor Bluetooth Speaker offers pretty decent bang for your buck as long as your device has an equalizer to ramp up the bass tones. Bluetooth speakers are a dime a dozen these days and range in quality, price, and features. The good thing about that is, there’s plenty of choice. 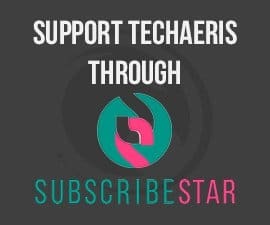 The bad thing is, there’s plenty of choice and it can get confusing trying to pick the best bang for your buck — and that’s where sites like Techaeris come in! 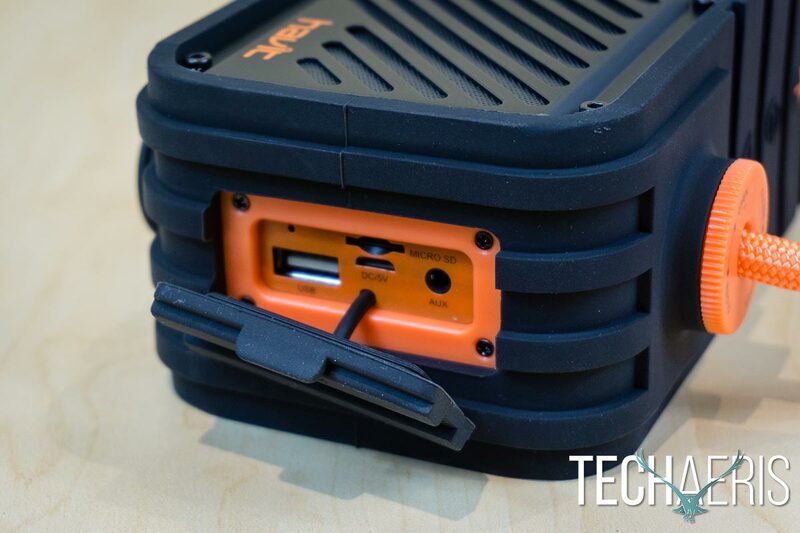 Our Havit M22 review takes a look at a rugged, outdoor Bluetooth speaker with dual 10W drivers that is water-resistant and also allows you to charge your smartphone and has a MicroSD card slot at an affordable price. 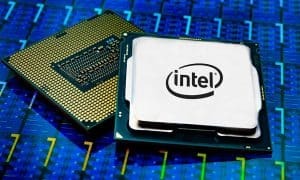 Read on to see how it performs. Latest Bluetooth 4.2 Technology: Support connect with Echo Dot & Alexa, Play Music from Amazon Music, Spotify, Pandora, iHeartRadio, and TuneIn. 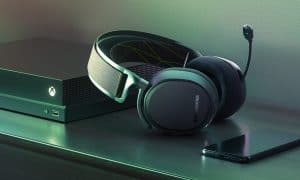 Advanced Bluetooth tech offers an extended 66ft connection range (without any obstacle), automatically reconnects to the device used last, make hands-free calls with the built-in mic. Up to 20 Hours Playtime: Build in 5000mAh breakthrough rechargeable battery offers up to 20 hours of music enjoyment in 75% volume. Power bank function supported. Never worry about a long journey. IPX5 Waterproof & Shockproof: IPX5 certified resist against water, silicone surface protection design, dustproof & shockproof, perfect for a party, camping, hiking, traveling, beach and more outdoor activities. Flexible Detachable Hemp Rope Handle: DIY handle design, take the speaker in the way as you like, horizontal & vertical taking both supported, sporty looking, portable & convenient. 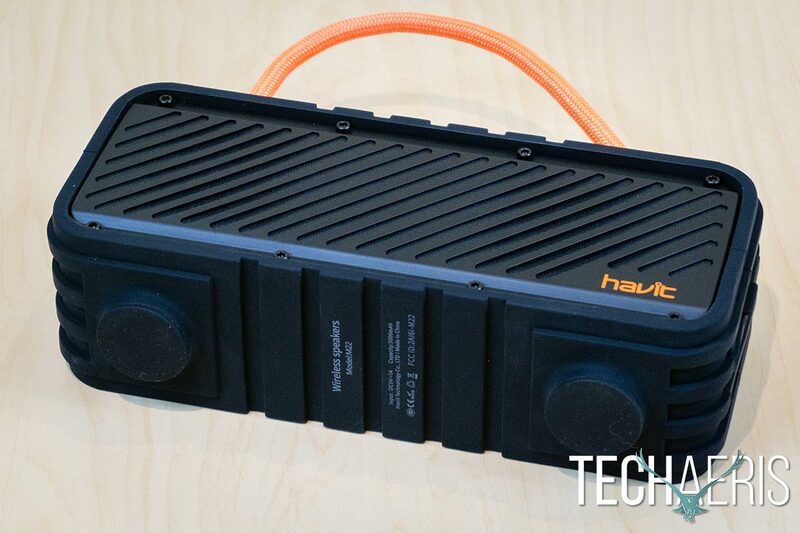 The Havit M22 Outdoor Bluetooth Speaker definitely looks like a rugged outdoor speaker. 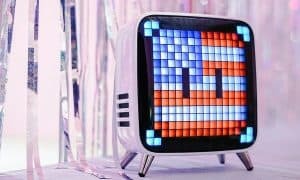 Rectangular in shape, the front and back speaker grilles are made from a heavy duty feeling metal with the Havit logo in orange on the lower right hand corner of the front. The metal speaker cover is held in place by four screws with extruded heads on the top and bottom (for a total of eight on each side) which gives the speaker an even more rugged look. 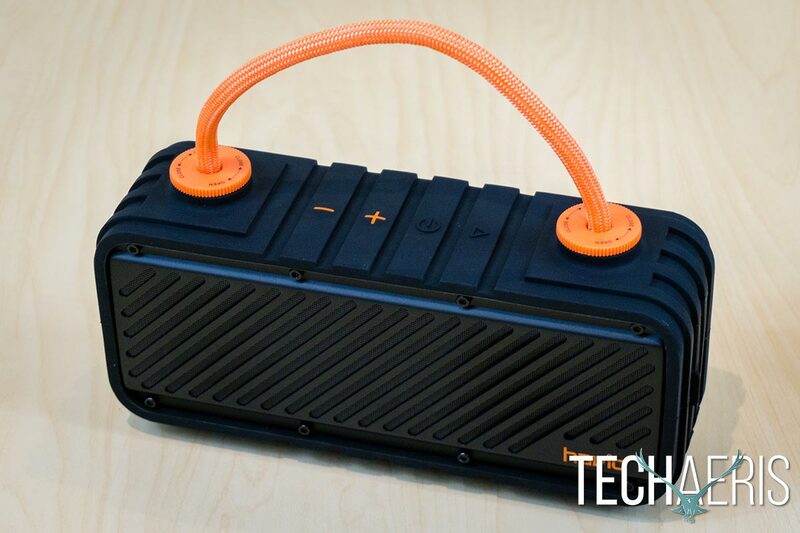 The Havit M22 Outdoor Bluetooth Speaker definitely has a rugged look. The entire top, bottom, and sides of the speaker are wrapped in a thick black rubber shell with plenty of ridges to add to the rugged look. On the top right and left, as well as the bottom right and left, is a round “foot” so to speak. On the top, a thick orange hemp handle is screwed onto the “feet” with an orange plastic cap. The feet on the bottom act as just that, feet. 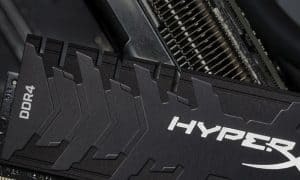 However, the plastic caps can be removed from the top and a thin black rubber cap can be removed from the feet. 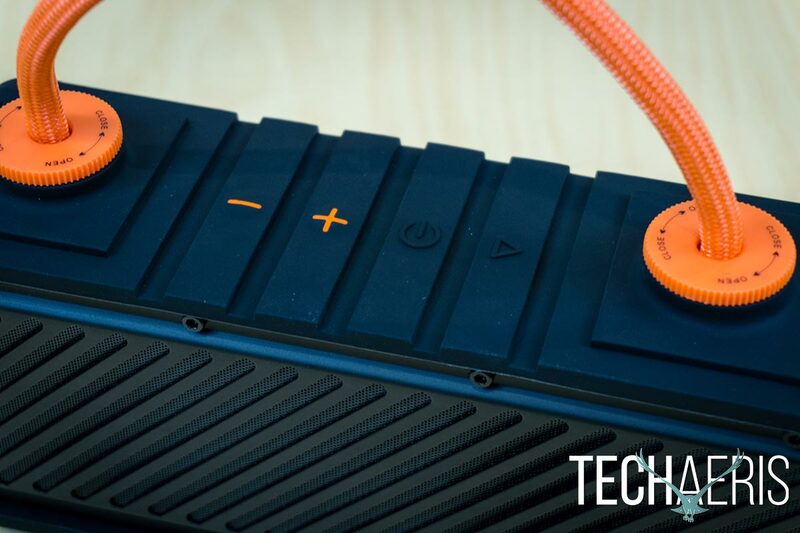 When removed, you can insert the plastic cap with the handle to one of the feet so that you can carry the speaker vertically instead of horizontally if you choose to. The bottom of the Havit M22 Bluetooth speaker. The top of the speaker houses the four buttons which are centered in long vertical strips that run from the front to the back of the speaker. The volume up/down buttons (which double as next and previous track buttons) have an orange – or + and are a round bubble type button. The power and play buttons are black and it’s the power and play symbols that are extruded from the rubber to indicate they are buttons. The top controls on the Havit M22 Bluetooth speaker. Finally, on the right side of the speaker is a rubber flap that, when opened, reveals the AUX port, LED indicator light, Micro-USB charging port, USB Type-A output, and MicroSD card slot. The ports are housed behind a rubber flap to give the speaker an IPX5 water-resistant rating. The speaker is definitely rugged looking and the movable handle is a nice touch as well. 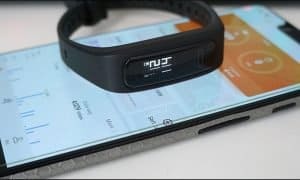 Even though it’s only IPX5 water-resistant, it’ll definitely survive outdoor use and the occasional splashes as long as the rubber flap which covers the ports is closed. 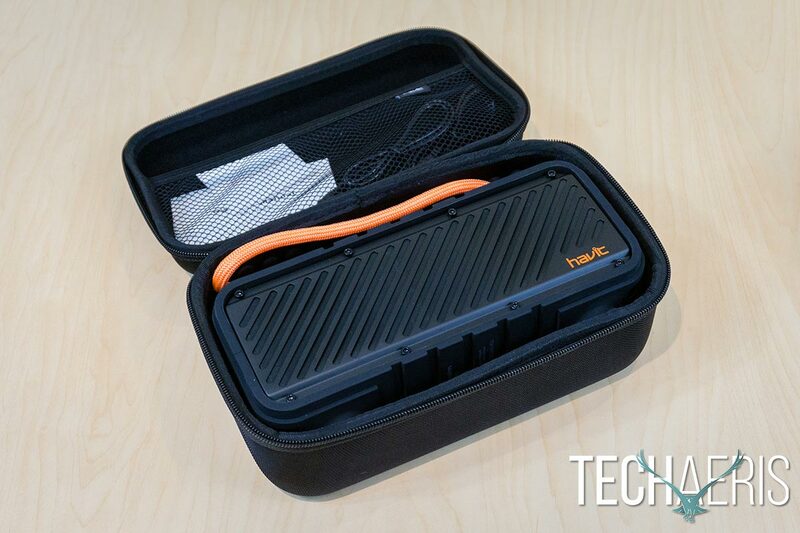 The Havit M22 also comes with a black canvas hard-shelled carrying case. On the outside, there is a nylon carrying strap for easier portability. The lid opens via a dual zipper setup and the inside is padded with an inlay which features some extra bubble cushioning. On the underside of the lid is a mesh pouch for the included cables and anything else small you may want to carry inside it. It’s definitely nice to see Havit including a carrying case makes it easier to transport and store your speaker while not in use without worrying about it getting scuffed up or damaged. The hard-shelled carrying case is a nice bonus. The Havit M22 Outdoor Bluetooth Speaker is as easy to use as any other. The first time you turn it on, it will enter pairing mode. Pair it with your smartphone as you would any other Bluetooth device and you’re good to go. The Play button acts as a play, pause, answer a call, end a call, reject a call, or put the current call on hold and answer an incoming call and works as expected. The volume controls double as track skip buttons and also work as expected. Charging your smartphone from the speaker is just as easy, simply open the flap and plug your smartphone into the USB-A port. You’re not going to get fast charging but it’ll be enough to keep you running while streaming to the speaker or if you just need a top up until you get to a faster charger. Finally, using it with a MicroSD card or via the AUX port is easy as well. Simply place a MicroSD card in the slot or plug in a device with the 3.5mm AUX jack and press play and you’re good to go. As far as sound quality is concerned, the Havit M22 Bluetooth speaker is decently loud given it has two 10W drivers housed inside. Unfortunately, out of the box there isn’t as much bass as I’d like to see but the highs and mids are fairly balanced and crisp and clear at just about any volume. Fortunately, most smartphones have an onboard equalizer and when enabled, the bass levels do pick up albeit a bit on the punchy side of things versus the nice deep resonating bass I prefer. For the most part, however, the M22 sounds decent enough given the price you’re paying for it. One thing the Havit M22 has going for it is independent volume controls. Too many Bluetooth speakers omit this and it’s a pretty big omission in my opinion. 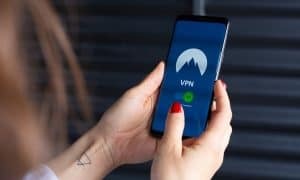 Being able to fine-tune your volume from your speaker without increasing or decreasing the volume on your smartphone for media playback is an appreciated feature. With Bluetooth v4.2 on board, Havit claims the standard 10m of reception range with this speaker. We were able to get that and more when testing and I was able to stream music from my smartphone regardless of where it was in the house to the speaker. As far as call quality is concerned, it’s about the same as other speakers. It’s decent enough but the closer you are to the speaker the better the other party can hear you. With a 5,000mAh battery, Havit says the speaker should last you 10, 16, or 20 hours depending on what literature or website your read. According to the box and included user guide, you should see 16 hours of battery life — of course, that is volume and music type dependent. 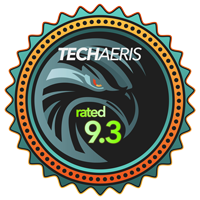 During our testing, we were able to get just over 12 hours multiple times listening to the speaker at about 75% volume and a range of music genres. While it’s not the 16 the box claims (you may get this on 50% volume), 12 is still pretty decent and should get you through a day’s worth of straight listening easily. As far as charging the speaker goes, it took us just over 5 hours each time it died to recharge it fully. With an MSRP of $62.99USD, the Havit M22 Outdoor Bluetooth Speaker is currently on sale at Amazon for $49.99USD. 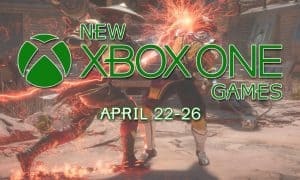 Even though there’s not much bass out of the box, this is easily rectified if your smartphone or the device you’re streaming from has an equalizer. Given the design, sound quality, and other features, the M22 is reasonably priced. 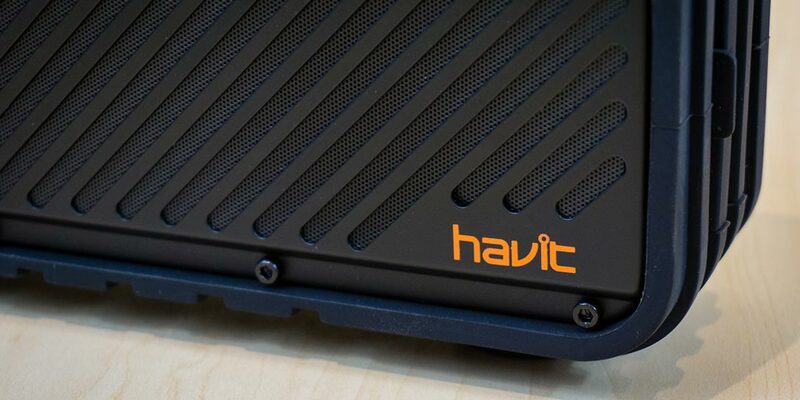 Havit is most likely a name you haven’t heard of before, but the Havit M22 Outdoor Bluetooth Speaker offers pretty decent bang for your buck as long as your device has an equalizer to ramp up the bass tones. 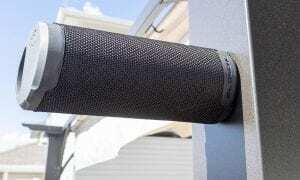 *We were sent a sample of the Havit M22 Outdoor Bluetooth Speaker for the purposes of this review.